CONGRATULATIONS, FRANCESCA BUCHALSKI AND BILL DALTON! We were blown away by the amount of submissions we received! Over 1,470 entries were counted! New Jersey wildlife photographers, CWF board members and staff poured over the entries to choose our winners. Today, we are thrilled to announce both first place winners. Francesca was so happy to have won our contest! She shared more about the image and her passion for photography with CWF: “I took that photo at the Cape May Meadow during last year’s fall hawk migration festival. My mom and I are avid birders, and we love going to the migrations in Cape May! We were bringing up the rear on a guided walk, and just as we started walking down the path through the reeds, I heard ‘Wows!’ and ‘Cools!’ up ahead. As we caught up, we saw that everyone was looking at a praying mantis perched on a man’s telephoto lens! I had my camera with me to photograph birds, but that was an opportunity that couldn’t be missed! I thought it was pretty interesting and ironic that the man couldn’t photograph the praying mantis, even though it was on his camera (he couldn’t stop laughing), and it posed there for a long time. It was a great way to start the walk! “I’ve only been photographing wildlife for about 3 years, just for fun. I started off by taking pictures of the birds that came to our feeders, and now I bring my camera on all of my birding adventures. As for my favorite New Jersey species…that’s a tough one! I think I would have to go with the osprey; they’re so charismatic in their coloring, hunting habits, and cool ‘opposable’ talon. I also really enjoy how easy it is to observe them by boat; whenever I think about the wetlands or the back bays of New Jersey, I automatically think ‘osprey.’ They also have such a great comeback story, its almost impossible not to love them! Bill explained to CWF, “I once read that a photographer’s definition of luck is: Preparedness over opportunity = LUCK! That was certainly the case when I photographed the skimmers at Forsythe on a early spring morning. On a previous visit, I saw a mature peregrine falcon perched at sunrise not far from the observation tower. I returned a day or two later with the proper equipment for low light, high speed photography, with hopes to get early light shots of the peregrine. The falcon was there but I noticed 6 to 10 black skimmers feeding about 50 yards from my location. The light from the predawn sky and clouds reflected perfectly on the windless water’s surface. I took about 50 shots but one shot caught the skimmer in exactly the right position. The line between sky and water vanished! The camera should get all the credit, I just pushed a button! I’ve been a nature photographer (hobby) for decades. My first camera back in the 70’s was a Minolta SRT 101. Boy has photography come a long way since the days of only film! “I love to kid people by telling them I’m an endangered species. By that, I mean, I was born and raised in Monmouth County. One of the most important goals in [CWF]’s mission statement is, ‘educating everyone who lives in New Jersey about our shared wild heritage and our shared responsibility to protect it.’ We’ve come a long way in accomplishing those goals but so much more has to be done. “I must admit being a born and raised Jersey Shore boy that my favorite species is the osprey. I vividly remember back in the 1950’s asking my dad while driving down a shore road in Monmouth County, why the power company men were knocking down bird’s nests that were atop of the poles! Those nests were ospreys and the nests on the poles were considered a nuisance! Years later I am proud to have been partly responsible for one of the first osprey nesting programs in Monmouth County. I convinced the company I worked for to enter into an agreement with the NJDEP to relocate a nest from the Keansburg pier to our location in Union Beach. At that time ospreys were on the threatened and endangered species list. “The transfer of the nest was successful and at that time (1987) it was the most northern osprey nest in Monmouth County. Now I see nests in dozens of locations throughout the county! The osprey is truly an example (along with many other species) on how educating the public about our wildlife heritage worked! 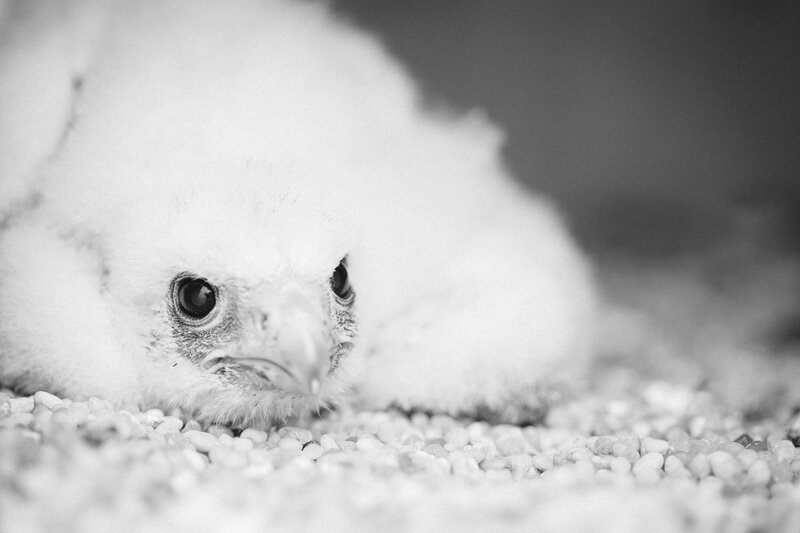 This week we visited the latest peregrine falcon nest in New Jersey. We were there to check for hatching. Here is what we found. A lone 17 day old male falcon. He is the youngest falcon in New Jersey. Photo by Ben Wurst.